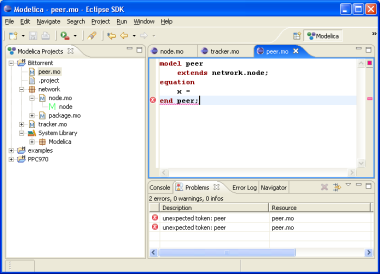 The Modelica Development Tooling (MDT) Eclipse Plug-In integrates the OpenModelica compiler with Eclipse. MDT, together with the OpenModelica compiler, provides an environment for working with Modelica projects. MDT was developed by two loony undergraduate students in their eternal quest for a degree. They have finished with their master thesis in April 2006 and, since then, the responsible with maintaining and enhancing MDT is Adrian Pop. 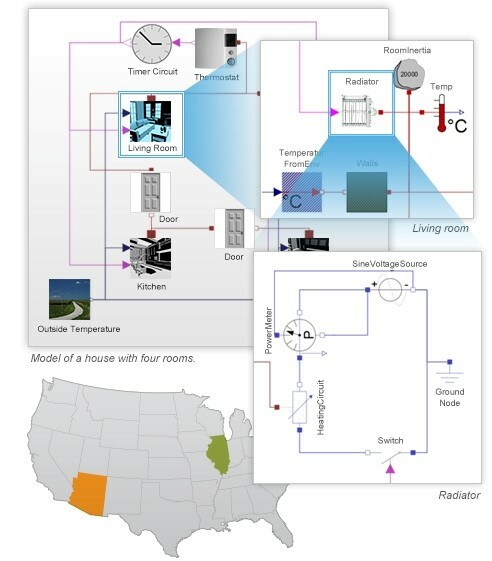 The work on the plugin is a part of the larger project by PELAB which aims to create a complete Modelica and MetaModelica modeling, compilation and simulation environment. MDT is used at PELAB for the development of the OpenModelica compiler. To use MDT you need the OpenModelica Compiler and Eclipse installed on your system. You can find MDT documentation HERE. You will also need Java 5.0 (aka 1.5) to use the plugin. Here you can find an MDT installation howto. update site which is located at http://www.ida.liu.se/labs/pelab/modelica/OpenModelica/MDT/. If you are not sure how to accomplish this, just follow the instructions below. Another way to install MDT is by downloading a zip file, unzip it locally and point the Eclipse to the unpacked directory. The zip file will unpack to a local directory called "mdt"
Add the "mdt" directory as a local site (this is different from version to version) and then install the latest version of MDT from this local site. A trac system is available for MDT, please contribute by reporting bugs. Modelica Development Tooling (MDT) is part of OpenModelica and is free software distributed under the OSMC-PL License. This basically means you can do whatever you want with it non-commercially. To use it comercially you need to be a member of the Open Source Modelica Consortium. source and implement something you always wanted, and contribute it to the MDT! You can access the source code from the project's repository at https://openmodelica.org/svn/MDT/trunk. Anonymous read access is not enabled. You must use user: anonymous password: none. The primary source of information for the aspiring MDT developer is the MDT documentation. A Trac project management system for reporting bugs and follow development is now available. Version 0.7.22 has been released. You can get the binary release from the update site. For this release, you can use the OpenModelica compiler. Version 0.7.7 has been released. You can get the binary release from the update site. A short document on MDT installation HowTo. We have a new website for ModelicaML - A UML Profile for Modelica. Version 0.7.2 has been released. You can get the binary release from the update site. If you want to contact the current author and maintainer of MDT send an email to Adrian Pop [Adrian.Pop@liu.se]. The MDT authors can be contacted via: or . Bug reports, patches, general feed back or anything else is welcome.